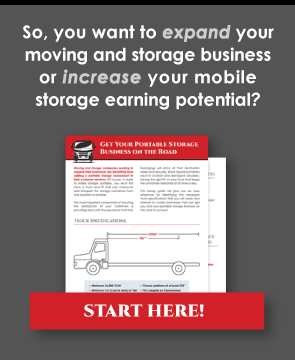 As a self storage business becomes established, a storage operator can expand their facility by offering mobile storage solutions. A portable storage delivery system lifts and transports mobile storage containers. When mounted to a truck, our delivery equipment adapts to a variety of container sizes. Are you looking to add additional revenue to your self storage business? Learn how the Horizontal Lift system can help in this post! Our patented Horizontal Lift system is a hydraulically controlled portable storage lift. The system adapts to portable storage units of different sizes and different manufacturers. The lifting lug used in a Horizontal Lift system works with portable containers up to 8 feet wide and 20 feet long. Our storage container lift system is hydraulically controlled and can lift up to 10,000 pounds. This allows for a secure attachment to the containers on the trucks. Unlike competitors, Horizontal Lift is the only patented, non-franchise, non-dealership business in the industry. We’ve engineered our horizontal lift system to be the most advanced, long-lasting portable storage system on the market today. We also do not charge high franchise fees when selling our portable storage delivery systems so that your business can operate and expand on YOUR terms. Mobile storage companies can grow beyond their local community with the correct portable storage delivery system. At Horizontal Lift, we make sure that your mobile self storage investment yields good returns by providing high-quality equipment. Contact us and one of our portable storage professionals can answer any questions and get you started with expanding your self storage facility today.